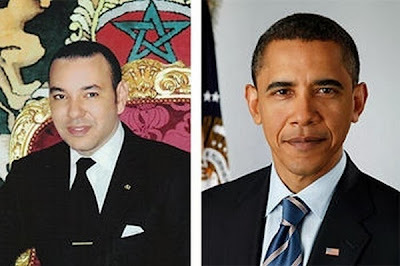 King Mohammed VI and President Obama will meet in the Oval Office. WASHINGTON, DC --- President Barack Obama will hold a bilateral meeting with King Mohammed VI of Morocco at the White House this afternoon. The meeting will highlight the long-standing friendship between the United States and Morocco, dating to George Washington's administration, and strengthen the strategic partnership between the two countries. According to the White House, the President looks forward to discussing a range of issues of mutual interest with King Mohammed VI, including support for Morocco’s democratic and economic reforms. This visit is also an opportunity to increase cooperation on addressing regional challenges, including countering violent extremism, supporting democratic transitions, and promoting economic development in the Middle East and Africa. "The King's visit comes visit to Washington comes at a critical time for Morocco as well as the United States, lending it an important historical dimension," writes political analyst Samir Bennis. Click here to read his analysis in Morocco World News, a must-read media outlet for anyone interested in Morocco and the Northwest Africa region known as the Maghreb. Morocco and the U.S enjoy a cordial relationship that dates back to 1777 when the Kingdom was the first to give a naval salute to the United States, heralding the new nation as a sovereign, independent one. In 1787, the U.S Congress ratified a Treaty of Peace and Friendship between the two nations which is still in force today and is the longest unbroken treaty relationship in U.S. history. U.S. Marine Corps Gen. James L. Jones (Ret.) and Ahmed Charai comment: "We believe the encounter presents an opportunity for both leaders to build on the historic alliance at a time of global economic malaise as well as unprecedented strife and fraught transition in the Arab world: their nations share new interests, and evolving foreign policy views in both countries have the potential to complement each other." Click here to read the entire Jones-Chari essay. Jones, a board director at the Atlantic Council, is a former National Security Advisor to President Obama (2009-2010) and served as 32nd Commandant of the Marine Corps. Charai is a publisher and a board director of the Atlantic Council and the Center for Strategic and International Studies. Click below to listen to the Atlantic Council's discussion on the new U.S.-Morocco strategic partnership. Prior to his arrival in Washington, the Moroccan monarch visited the United Arab Emirates—together with Saudi Arabia and Kuwait, one of the most prominent governments in the region in opposition to Iranian and Muslim Brotherhood expansionism in Arab countries. The king’s relations with the United Arab Emirates are so strong that the mother of the reigning emir of Dubai routinely refers to him as “my son.” There is a comparable degree of deep, visceral connection between King Mohammed VI and the rulers of most of the other Gulf states, as well as the enduring Kingdom of Jordan. Add to these bonds the fact that Morocco is also America’s oldest Arab ally—the first country, indeed, to recognize the United States of America in 1777—and the potential for King Muhammad VI to bridge present gaps between the United States and its longtime Arab partners becomes obvious.